Heat 1 tablespoon oil in 12-inch heavy-bottomed skillet over medium-high heat until hot but not smoking. Add onion and sauté, stirring frequently, until browned, 8 to 10 minutes. Transfer onion to small bowl and set aside. Meanwhile, place diced potatoes in large saucepan, cover with 1/2 inch water, add 1 teaspoon salt, and place over high heat. As soon as water begins to boil, about 6 minutes, drain potatoes thoroughly in colander. Heat butter and remaining 1 1/2 tablespoons oil in now-empty skillet over medium-high heat until butter foams. Add potatoes and shake skillet to evenly distribute potatoes in single layer; make sure that one side of each piece is touching surface of skillet. Cook without stirring until potatoes are golden brown on bottom, about 4 to 5 minutes, then carefully turn potatoes with a spatula. Spread potatoes in single layer in skillet again and repeat process until potatoes are tender and browned on most sides, turning three to four times, 10 to 15 minutes longer. Add onions, paprika, garlic powder, onion powder, remaining 1/4 teaspoon salt, and pepper to taste; stir to blend. Transfer to a baking sheet and place in warm oven until ready to serve with eggs below. Over medium high heat, heat a nonstick skillet with 1 tablespoon oil. Add minced garlic and mushrooms, sautéing until softened. Add bell peppers and bacon, cooking until softened and warmed through. In a bowl, whisk together the eggs and milk. Season with salt and pepper as desired. Pour the egg mixture over the sautéed vegetables and cook on one side until set. Carefully flip or turn over to cook the other side. 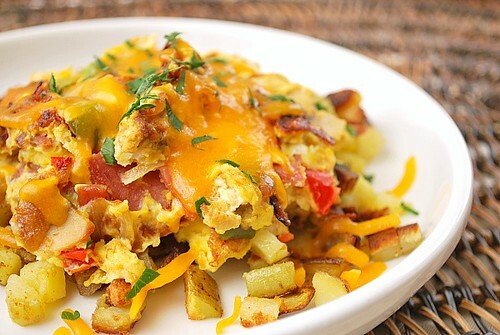 Plate the diner style home fries and place the eggs over the potatoes. Top with cheese, garnish with chopped fresh parsley and serve hot. That looks so fantastic. I wish I had a plate of that right now. I will have to try this. I have bookmarked so many of your recipes. Thank you. And you just helped me with my Christmas breakfast. Every year my husband and I stay home for Christmas. I cook breakfast for the both of us. This dish is perfect for Christmas this year. Thanks so much! !